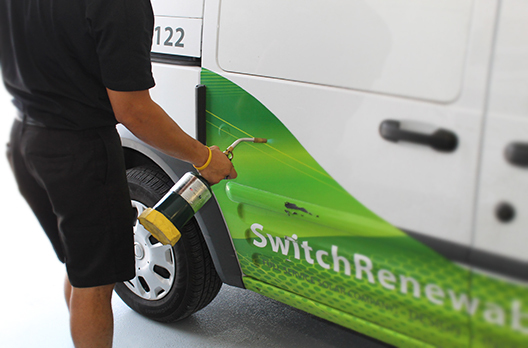 Vehicle Wrap Removal is a lengthy process, but if it’s done right, your paint job should be in the exact condition it was in the day vinyl was applied. That’s where Absolute Perfection comes in. The right tools combined with an experienced team of vinyl removers results in a car that’s as good as the day you brought it in. We do wrap removals for wraps we installed, as well as one’s we didn’t install. Absolute Perfection uses the combination of a plastic razor blade and heat from a torch gun resulting in a seamless vinyl wrap removal. 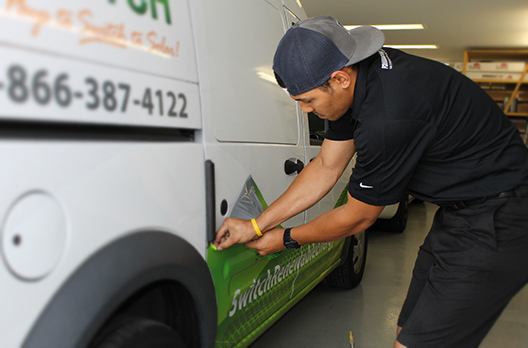 3M Certified Installer Marc Fong doing a wrap removal. The thin plastic razor blade allows us to get under the wrap without ruining the paint underneath that the sharpness of a metal razor blade would. Room temperature during the removal is also a big factor. For a removal, you want a warm environment to work in. Absolute Perfection’s temperature controlled shop allows for the best environment to install and remove vinyl wraps. Wraps have a shelf life of up to 10 year; however, that doesn’t mean the power of the sun doesn’t take a toll on the vinyl. Years of solar abuse typically lead to cracking and drying of car wraps. Once a wrap starts to crack, the process isn’t as simple and you have to remove it piece by piece using a plastic razor blade and a heat torch or heat gun. The heat gives the vinyl molecules new life so it can peel easily. Once all the pieces are removed, there is typically adhesive residue. Absolute Perfection uses the highest quality vinyl made by 3m, which shouldn’t leave too much adhesive; however, we also remove wrap that we didn’t initially install. Adhesive cant be scraped off; we have to use a chemical called Rapid Remover by RapidTac, then go over the vehicle with IPA alcohol to get rid of toxic chemicals. If you have any questions, give us a call at (866) 390-6790 or click here to contact a representative. Have an idea and don't know where to start? Set up a consultation to talk to one of our project managers or graphic designers.